Stair Warehouse has the largest variety of stair handrails on the web. And our prices are great. 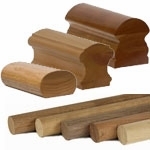 Our stair handrails are made without finger joints from the highest grade of hardwoods available. 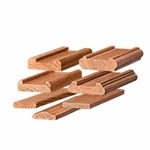 However, if you need an inexpensive finger jointed handrail, we have a 6010 handrail in Red Oak that may work. We have straight handrail in a modern round design and traditional handrails in a shaped design. We also have nice wall rails and Contemporary Stainless Steel Handrails. 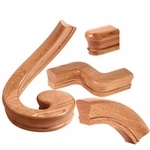 If you have a curve in your staircase, we have bending handrail that comes with the moldings included. Many of our contractors and DIY's use our bending handrail as it is so easy to install and seamless. In order to prevent injuries such as accidental fall or tumbling down from the stairs, most staircases are designed with a Stair Handrail that is intended to be grasped on by the handler to provide safety and support while ascending or descending the stairs. It should be built in such a way that persons who wish to go up or go down from the stairs may have the ease and comfort in doing so. The Stair Handrail is a common component of a staircase. But it does not necessarily mean that all staircases has it. Modern staircase design, especially those that rely heavily on a minimalist�s vision tend to do away with putting them up with the stairs. This may be a good idea especially if there are no curious and exploitative children or frail elderly residing in the home. But if children and older adults are living there, putting up a handrail is always the best choice. It doesn't need to be always plain and simple. 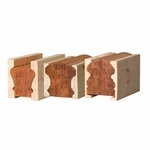 You may opt to add intricate carvings or embellishments as long as the handrail is strong and sturdy. We have many section to help you find what your looking for like 4000 Series Contemporary Handrail, 6010 Handrail, 6210 Handrail, 6310 Handrail, 6400 Handrail, 6519 Handrail, 6710 Handrail, 6910 Handrail, 9100 Handrail, Shoerail, and Fillet.